I'm sitting on a bench at the quiet end of the second floor of Apple's Covent Garden store doing my best to look loaded. It's day one of Apple Watch pre-orders and I am a customer looking to purchase the 18-karat gold Watch Edition which starts at $10,000 - at least, that's what I want Apple to think. In reality, of course, I'm a journalist who's bluffed his way into one of the coveted try-on appointments; the only way that anyone gets to see what the smartwatch of the moment might look like at their wrist. With this, one of the most expensive computers Apple has ever sold, I just had to know how the company was going to treat its most treasured customers now that it really is in the business of selling luxuries. So far, I'm not feeling that special. I arrived at the store 10 minutes before my appointment to see how the team might ease the wait of a supposed high-roller such as my wouldbe self. Their strategy has been to leave me sitting on this reasonably stylish but not particularly comfortable piece of furniture feeling like a spare part while the toing and froing security and staff hesitate to ask me what it is that I'm actually doing. In fairness, I do look a little strange. Due to severe wardrobe limitations, the only believable cover at my disposal is that of a music producer. I'm not even sure what kind. I'm wearing my normal jeans, my normal trainers and my normal shirt which I normally save for occasions when I'm trying to look fashionable. What's really selling my look, as far as I'm convinced, is a pair of Tens sunglasses - which I've promised myself I will not take off now matter how hard it is to see what I'm doing - and a solidly uncommunicative demeanour that I imagine some of the semi-genius and super-rich might possess. I'm sure there's the odd giggle around me as I stare, unflinching like some kind of lo-fi Karl Lagerfeld, right through the customers browsing headphones and audio cables and beyond to the far wall. It doesn't bother me. I've got my game face on. If I don't talk, the sales assistants will simply have to fill the empty space with their nonsense chit chat. The lady I can see through the glass door and at the table in the appointment slot before mine finally finishes and sashays past my bench, out into the real world. She has a trendier haircut than mine. Her clothes are more believable than mine, but it's too late now and I'm shown into the room as I hope to god that there's no familiar faces from Apple's PR team waiting to bust my little charade wide open. These aren't the oak-panelled, crushed velvet surroundings I'd pictured. My try-on session is in what appears to be a boardroom of sorts with a monitor at one end of a large glass table flanked by a company of chairs that are more kitchen than cushioned. My two hosts, whom, thankfully, I've never met before are clearly much more nervous than I am and become increasingly so at my one word answers and total lack of warmth. They ask me my name - something that they should already know from my Apple ID used to book the appointment in the first place - sit me down and, finally, offer me that drink that I'd have received even at my local ten-pound hairdresser's long before now; but, as has been expressed to me by each and every staff member I've encountered since announcing my arrival, this is their first day of this. "Would you like some water at all?" says staffer A. "Sparkling," I reply in a strange voice I seem to have ad libbed on to my character. "Er, we only have still." In a plastic bottle, as it turns out. Another minor fault. We settle into the meeting proper and A takes the lead gently and very respectfully probing my wants and needs as a busy and connected music mogul. Then I am taken through the Watch OS on one of the standard Apple Watches because it's the only one that isn't running on demo mode. What's all a bit alien for the first minute or two quickly becomes rather familiar. The Digital Crown works as a mouse of sorts - it scrolls and selects - while the other button takes you back much like the home key on an iPhone. Combined with the two kinds of touchscreen press, it's not exactly second nature but we're picking it up quickly enough and there's a whole lot of fun to be had playing with the device. What's left when that novelty wears off is another matter. "Which artists do you work with?" asks A, his confidence momentarily peaking between demo difficulties. "Mostly dance acts," I reply struggling to think of any. "DJ Fresh...Goldfrapp," I offer, my mind clutching to whatever had been playing in-store while I'd been waiting. I decide to leave it there and go mute again just in case the next words out of my mouth are "monkey tennis". While playing with the Apple Watch is what the tech journalist in me wants to do, my alter ego forces me to push the box to one side and ask to see what I came for. B comes forward to see which versions of the Watch Edition I'm interested in trying on. He should already know this from the favourites I've pre-selected in the Apple Store app. He shuffles off downstairs to fetch the 42mm yellow gold case Edition with the black classic buckle and one with the midnight blue colour. Both retail at £12,000. Apple's rule with the Watch Edition is that they need to be accompanied at all times by at least one security guard, one of whom has been waiting outside the room until now. A few moments later and the first of the gold watches is delivered in its leather-covered and velvet-lined presentation box that also takes a charging cable if you'd like to keep the device powered up while it sleeps. A suggests it could be kept like this on a regular overnight basis but I'm not convinced it's worth the bedside table real estate. Doing my best to give the air of a person who handles these kinds of things all the time, I fumble a little with the gold buckle while trying to work it away from the stiff, new, natural leather strap - apparently made from cows kept in fields without electric fences around them which can damage the hide - and, finally, I'm turning the case over in my hands with this smartwatch of the moment exactly where I want it; and, I've got to say, it's a lot nicer than I was expecting. The front looks as classy as you might expect - it's neat, it's smart - but it's the back that really sells it. The four optics that make the heart rate sensor (infrared and visible LEDs plus two photosensors) come off looking something like the clockwork of a traditional mechanical watch when finished in gold, and the ring of engraving that runs all the way around just adds to that luxury feel. There's also some lovely little touches such as the way that the straps slide out from the casing revealing the hallmarks of the metal which itself appears to have incorporated the Apple logo into the standard markings that reveal the quality and origins the metal. "I'd like to see the Midnight Blue Edition next to this one," I say trying not to marvel for too long at the one I have in front of me. "Er, that is the Midnight Blue," says A receiving full marks for not suggesting that I take my sunglasses off. There's a bit of a palaver, like some tech store version of the missionaries and cannibals problem, as the security guard has to take the Edition in front of us downstairs to bring both watches back up. While we're waiting, time has ticked on and we're well into the next appointment. I'm never hurried at any point in the proceedings but A and B begin to discuss the possibility of bringing the next client in at the same time. Again, it's not the most red carpet of moves on quite a few fronts. They shouldn't really be discussing that in front of the customer and, if that is the plan, they should really ask me first. Eventually, they do check that I don't mind and a technophile city-type perches himself eagerly on a chair at the other end of the long table with A taking him through his particulars. My second watch comes up, I try it on, we take some photos and the appointment draws to an end with B informative and closing without being pushy. Aside getting my name wrong as we shake hands, it's a pleasant departure. I'm back in the real world with the real customers and I can finally remove my shades. Did this feel like a premium experience? Not particularly, but then maybe it's not supposed to be a red carpet affair. It was a relatively private way for people to try on a very expensive item that simply might not be possible otherwise in a busy, bustling shop floor. The fashion-style hierarchy, and the smugness that comes with it, was in place simply by imposing the rule of making an appointment. It was all a bit new to A and B but any mistakes they made with me on day one would doubtless have been self-corrected by now. They were both very helpful and extremely courteous. They had holes in their product knowledge but, again, they'd had absolutely zero hands-on time with the Watch before that day, so fair dos. Ideally, the Edition experience would be in a smaller room. It would be one-to-one, it would involve a drink of tea or coffee in a proper cup and saucer and you'd be looked after while you waited. That's all that really needs changing. It's possible that you'd get just that at Selfridges where the sessions also take place and where the staff are more used to such high-end transactions. 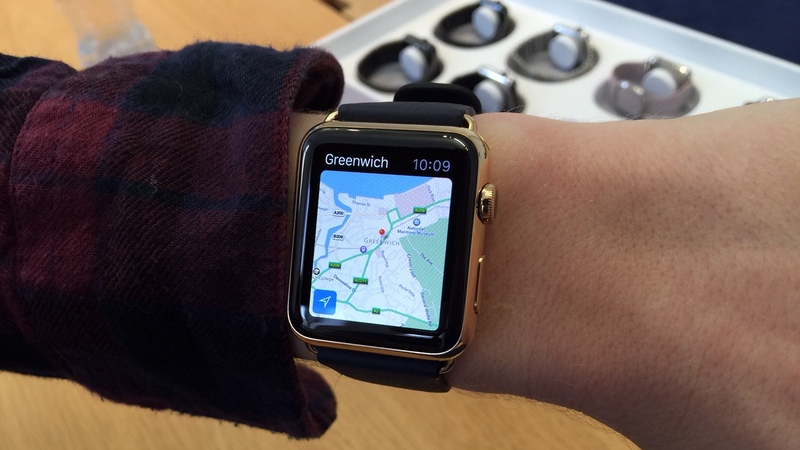 As for the Apple Watch Edition itself, it's a very nice thing; far nicer than what I'd expected. If I had 12 grand to spend, I don't think I'd buy one but that's a matter of my personal design taste more than anything else. The technology will date but these are nice watches with an appropriate sense of story and authenticity for the money involved. Whether you're a Lady, a city suit, a music producer or a technology journalist, you'd certainly be proud to wear one.